Kids can wrap themselves in dangling wires to the point of strangling, use them to pull heavy components from high surfaces onto their bodies and follow them to access electrical outlets that pose an electrocution risk. There are a variety of reasons why you should hide those wires, but not always a lot of obvious solutions to accomplish the task. 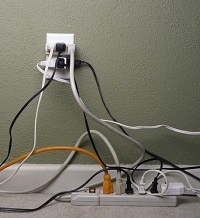 These tips can help you keep wires and cords out of sight and, more importantly, out of your little ones’ reach. Because electrical component wires can pose such a risk to children, there are commercially available products designed expressly for the concealment and obstruction of them to keep kids safe. These channels are hollow inside, and run the length of a flat surface to secure the cables in a way that makes them inaccessible to little fingers. They’re easily found through childproofing supply specialists, and can be painted to match the décor of your room for aesthetic purposes. While it’s not always a viable option for renters, taking advantage of a wall that runs along a closet allows you to build an entertainment center that keeps wires truly out of reach. Because they’re swept back through the wall to be plugged in inside a closet, kids aren’t able to tug on them, tangle themselves in the cords or even access the outlets they’re plugged into. Taking a page out of the loft style book can keep electrical wires safe from curious fingers while lending a bit of big-city flair to your room. Threading cables through repurposed metal plumbing pipes to act as a conduit for the cables is a stylish choice, but also one that’s so sturdy even the most determined little hands can’t get through to the contents. Just be sure that the pipes you’re using aren’t made of lead, as some repurposed or salvaged piping does come from very old homes that used dangerous lead pipes in years past. If cables are already a bit difficult to get to for your little one, you may be able to get away with simply choosing neutral cabling that blends in with the surrounding wall. The wires will be difficult to see and thus unlikely to spark curiosity, and also won’t catch the eyes of guests for a safe and stylish solution. If you’re forced to run long cables across any length of the room, it’s best to secure them to the floor with a commercial conduit, products designed for children’s safety or even heavy-duty tape under a large rug. This solution may not be effective against little ones that are crawling or toddling around, but they will keep older kids from tripping over wires stretched across the room as they run or play. There are professionals that make it their business to secure and hide cabling from kids in the interest of their safety. If you’re having trouble keeping wires and cords out of your child’s reach despite your best efforts, it may be time to call in the experts to ensure that your electronics, and especially your little ones, are safe.